[German]Microsoft Outlook users may run into the issue, that a search in all mailboxes or address books no longer return results. This is probably due to a recently installed update. A search in contacts that doesn’t return results could be related to Windows 10 V1803. recently there have been more and more messages from our users that the Outlook search in the mailboxes no longer delivers any results. This issue no longer occurs after a system reboot. The problem is that no root cause is known. And therefore no prevention is possible for users not yet affected. The administrator asked whether a relevant update (06/2016) is known, which could provide the cause. I was not aware of anything in this respect, and especially with regard to the June 2018 updates..
Re-index the Windows search. 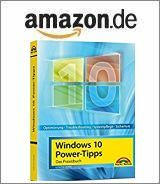 According to a German Technet forum post, this currently does not work under Windows 10. Another repair method (as of February 2016) is described in the Lookeen-Blog. In addition to re-indexing, the repair of the PST file is proposed. Some forum post pointed out, that a missing access right to Windows search folders may cause this issue. And I recommended a repair of Microsoft Office via control panel. Another root cause for similar issues and damaged pst files may be using personal folders with pst files over a network. Microsoft has published this article describing the side effects. For some users after updating to 16.0.9001.2171 and later versions, Outlook search returns no search results for POP and IMAP accounts. Until a fix or resolution is determined you can work around the issue by disabling Windows Desktop Search which will cause Outlook to use it’s built in search. The built-in search will display the message below to indicate it is not using the Windows Search service. The problem is caused by the March 2018 update and can be solved by not using the Windows search service. will force an internal Outlook search. A customer of us using Windows Server 2012R2, Windows 10 Clients with Office 365, and Exchange Online. They can no longer search for contacts in Outlook since the Windows 10 update to 1803 (was made last week). The contacts are located in a public Exchange folder and are used by all employees. The search then tells me “No elements found”.”. I see all about 2000 contacts, but the search function does not work. I already had Index rebuilt, but still no contacts in the search. I still have a computer here with Windows 10 version 1709 and with that also the search for the contacts goes as usual. The error description suggests that the issue is specifically related to Windows 10 April Update, in conjunction with Office 365 (Outlook 2016) and Exchange Online. I had suggested a repair of Office according to this Technet thread. There was also a hint from another user to look at Microsoft’s web page with known issues and fixes for Outlook. However, I did not find any Known Issues regarding the search for the June 2018 update. Another user reported similar issues on PST files located on network folders. This user wrote, that an Office 365 update from June 18, 2018 has changed Outlook to Version 16.0.9330.2124. That fixed the issue on his system. Maybe it’s helpful. This entry was posted in issue, Office, Windows and tagged issue, Outlook 2016, Windows 10. Bookmark the permalink.